SERVED: There is nothing worse than waiting on the tarmac for your plane to take off. You can't listen to your iPod, can't walk around, can't get up to go to the bathroom. 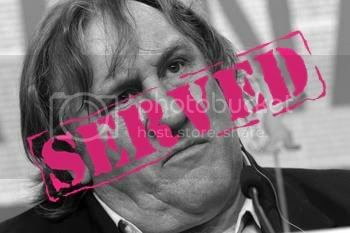 French actor Gerard Depardieu wasn't taking the "no bathroom" thing week. Depardieu was on a delayed flight from Paris to Dublin and needed to use the restroom. Because you can't get up while trafficking, the flight attendant told him no. Well no isn't something you tell the star of My Father, The Hero and Depardieu whipped it out and peed in the aisle. SERVED. C'mon, that is disgusting and while humorous just sooo gross. If they tell you no and you have to go, why not just run down the aisle to the bathroom and not just pee in the aisle? There's different stories now like he's drunk, he has a bladder problem. I don't know but peeing in an aisle is just nasty. SERVED.